Back from Holland now and what a great trip it was. I was playing with Sebastiaan Cornellisen and Frans Vollink. Here’s a clip of the first tune from the second gig. I’m sure more will surface on YouTube soon. Have you been sniffing glue Paul? hi all. re hair do ive checked flikr and there seems to be evidence that mike is morphing into that famous horticulturalist and tv personality…………. you guessed!!!! What Do You Think About When You Play? … As well as playing, I help guitarists figure out jazz improvisation & how to be more creative. I’ve taught for almost 20 years at The Royal Academy of Music, The Guildhall School of Music & Drama, and TrinityLaban, London, and now I’m putting everything I’ve learned into my Online Tuition Site ElectricCampfire.com – there, you’ll find courses, lessons and community designed to fuel your creative spark. We also regularly host Live Lessons where some of the best guitar educators on the planet share their insight, experience & inspiration to inspire you. 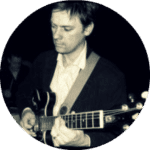 Jazz Guitar Lessons for New School Year!